¡Basta de ejecuciones en Egipto! Download a printable version of the statement here, and a pdf of the poster here. 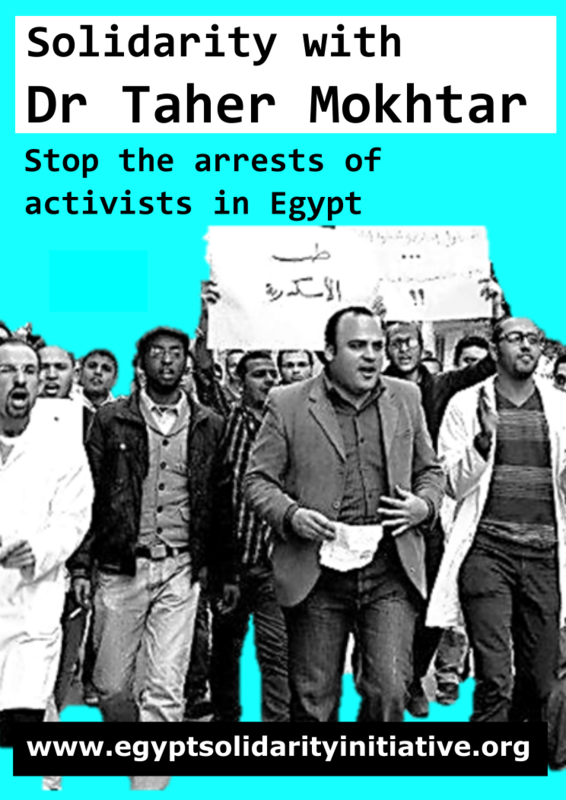 We were alarmed to hear that our colleague, Dr Taher Mokhtar, a member of the Rights and Freedoms Committee of the Egyptian Doctors Union, was arrested in a dawn raid on his home on 14 January 2016. Taher has played a key role in defending doctors’ and patients’ rights in Egypt, both as a leading activist with the Doctors’ Union and as a tireless campaigner for Egypt’s public health service. He is also an outspoken critic of the current military regime who has taken a courageous public stand in solidarity with victims of state repression across the political spectrum. We call for Taher’s immediate release and for any charges or case in preparation against him and others arrested with him to be dropped. We further call on the Egyptian government, military and security services to end the prosecution of opponents of the current regime for the peaceful exercise of their democratic rights, to release all those detained without a fair trial and to end the practice of forced disappearances. *Organization listed for identification purposes only. Dr. Ghayath Naisse, chef of surgery department, Centre Hospitalier Gneviéve de Gaulle Anthonioz, France. Dr. Amr Elshora, Egyptian medical syndicate, Egypt. Sophie Roborgh, PHD candidate, University of Cambridge, United Kingdom. David McNally, professor York University, Canadian Association of University Teachers, Canada. Dr. Maria Nikolakaki, Associate professor University of Peloponnese, Greece. Tim Nicholls, trade union official PCS, United Kingdom. Dr. Yannis Gourtsoyannis, University College Hospital, United Kingdom. Dr. Mona Kamal Ahmed, British Medical Association, United Kingdom. Dr. Dylan Roi, North West London Healthcare Trust, United Kingdom. Dr. Costis Melolidaki, Associate professor Department of Mathemeatics, University of Athens, Greece. Roxanne Roshandel, medical student AMC, the Netherlands. Dr. Lauren Robson, United Kingdom. Dr. Marc Lavietes, University Hospital / Newark NJ, USA. Dr. Ahmed Nenaa, orthopedic surgery Kasralainy, Egypt. Dirk Hoogenkamp, medical student, the Netherlands. Filareti Zafirpoulos, assistant professor, University of Patras, Greece. Elizabeth Wrigle-Field, Robert Wood Johnson Foundation Health and Society Scholar, Columbia University, USA. Alex Buckingham, SEIU Healthcare Wisconsin, USA. Philip Gasper, professor emeritus, Notre Dame de Namur University, USA. Dr. Antony Bolton, NSW Health, United Kingdom. Anita Sreedhar, medical student, RWJMS, USA. Dr. Brian Robinson, Unite & BMA, retired, United Kingdom. Maureen van der Pligt, worker union, FNW, Holland. Atte Houtsma, trade unionist FNV, Netherlands. Dr. Anna Roberts, Western Sussex NHS trust, United Kingdom. Robin Koller, medical student, University of Amsterdam, Netherlands. Anna Kolodziejczyk, medical student, United Kingdom. Michael Letwin, attorney, Former President, Association of Legal Aid Attorneys, United States. Dr. Brian Gibbons, general practice, FRCGP, Wales, UK. Michael Marchman, educator, United States. D.J Overdijk, trade unionist, FNV, Netherlands. Zambia Katsanevaki, NTUA, laboratory teaching staff, Ελλάδα. Emma Sundqvist, Lund University, Sweden. Maya Finoh, student, United States. Dr. Erick Thomas, United States. Dr. Ralph Rynes, retired physician, United States. Ian Crosson, teacher, Tower Hamlets College, UK. Petronella van der Hamsvoord, Netherlands. Edna Bonhomme, PhD Candidate, United States. Dr. Evangelia Antoniou, TEI ATHENS-MIDWIFERY, LECTURE OF MIDWIFESY, Greece. Judith Swift, WEA, URTU/GMB, teacher, UK. Dennis Kosuth, National Nurses United, Cook County Hospital, United States. Kelly Eamonn, senior lecturer, University of South Wales, UCU, United Kingdom. Dr. Ben Hart, GP, Chrisp Street Health Centre, BMA/Unite, United Kingdom. Elizabeth Lalasz, Nurse Representative-National Nurses Organizing Committee/National Nurses United (NNOC/NNU, John H. Stroger Jr. Hospital of Cook County, United States. Arthur Nicoll, communications officer, Dundee City Unison Branch, Unison, Scotland. Malcolm Povey, Professor of Food Physics, University of Leeds, UCU, United Kingdom. Dr. Christian Hogsbjerg, University of Leeds, UNISON, United Kingdom. John Baker, teacher (retired), EHWLC, UCU, United Kingdom. Dr. Gabriella Alberti, lecturer, University of Leeds, UCU, United Kingdom. Dr. Spyridon Symniakou, General Practitioner, UK. Bahadur Najak, Durham University, UCU, England. Anthony Arnove, editor Haymarket Books, National Writers Union, United States. Dr. Mervyn Nicholson, faculty, Thompson Rivers University, Canada. Dr. Sarah Alhulail, GP Trainee, BMA, United Kingdom. Mike Lammiman, Clinical trials coordinator, University of Hull/ Hull and East Yorkshire Hospitals NHS Trust, UCU, UK. Dr. Saber Elsafty, HSE Galway, GP, Ireland. Miriam Scharf, teacher, Newham Teachers Association, NUT, UK. Andrea Nader, Health Care Worker, North Yorks County Council, England. Tracy Kwon, nurse, United States. Maria Paradeisi, Assistant Professor, Panteion University, Ελλάδα. Cameron Stocks, medical student, Barts and the London, Unite, BMA, United Kingdom. Katinka Nauta, medical student, University of Groningen, Netherlands. Maarten Hoogland, Environmental Health, Netherlands. Jackie Oversby, Retired Charity Worker, Unite, United Kingdom. Sean Petty, HHC, Pedriatic Emergency Room Nurse, New York State Nurses Association, United States. Ella Wind, Graduate Student, New York University, GSOC-UAW, United States. Middle East-North Africa Justice Committee, National Lawyers Guild-International, USA. Suzanne Adely, Attorney, Labor for Palestine, USA. Audrey Bomse, lawyer, National Lawyers Guild, USA. Nicoline Maarschalk Meijer, house wife, FNV, Netherlands. Suzy Franklin, NHS, UNISON, UK. William Nicholas Gomes, Human Rights Defender and Freelance Journalist, United Kingdom. Camille Tsang, Unite the Union (Health), UK. Andy Ridley, Student Nurse, Bartshealth, UK. Jennifer Morrison, Nurse, Greater Glasgow and Clyde, Scotland, UK. S de Jong, medical student, University of Amsterdam, Netherlands. Nicola Saunders, Psychotherapist, Unite, UK. Rosalind Howell, Movement Psychotherapist, United Kingdom. Beatrice Millar, Councellor, Psychotherapists and Counsellors Union. Sandor Schokker, Internal Medicine, Westfriesgasthuis, Netherlands. Dr. Coral Jones, GP, London Fields Medical Centre, Unite, UK. Karen Pfeifer, retired, United States. Uklas Uklasius, Naval engineer, Greece. Dr. Jesse McLaren, Emergency Medicine, Canada. Steve Leigh, Fiscal Specialist, University of Washington, SEIU, USA. Carol Beck, Teaching Assistant Admin, School Secondary, Unite, UK. Reblogged this on MENA Solidarity Network.